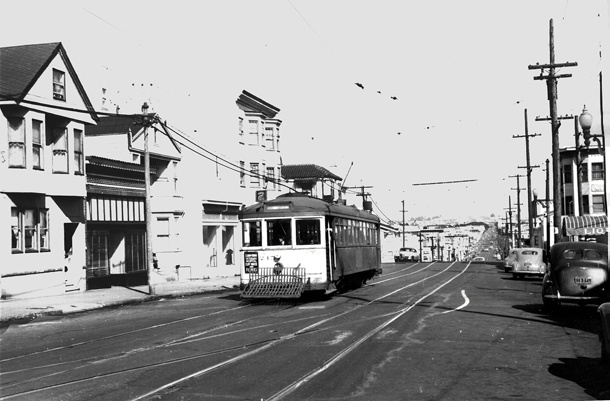 Clement at about 33rd Avenue, 1940s. The Richmond District was annexed to the City in 1856 under the provisions of the Consolidation Act which incorporated the City and County of San Francisco for the first time. Major areas of the district were originally developed as cemeteries. The Chinese located their cemetery out on the bluffs of Land's End, while the Municipal Golden Gate Cemetery was established to 33rd Avenue and Clement Street. The Richmond's diverse ethnic characteristics started in the early 1900s when Russian Orthodox and Eastern European Jews moved in from the Western Addition. Japanese Americans followed after World War II, when they returned from camps where they had been incarcerated in the desert to find their Western Addition homes occupied by war time workers. During the 1950s, so many Chinese bought houses along Clement Street that people called this area "New Chinatown." The Chinese are the largest minority in the Richmond. Pages in category "Richmond District"
Why is it called "Richmond"?